Fast Track Room Booking is web-based room booking software that will automate your operations and save your staff time, by managing meeting rooms, conferences, hot-desks, catering, A/V equipment, visitors and more. 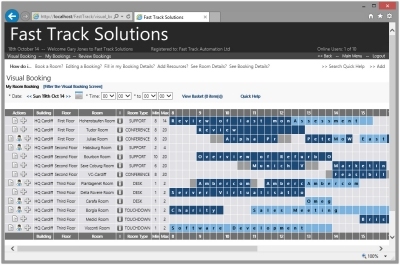 Fast Track Room Booking automates all aspects of room, desk and space booking, and resources (catering, A/V, porters, Outlook, Active Directory, etc.). The Room Booking system will inexpensively provide Self-Service enquiry or booking access for all your staff, increase your room utilisation % and reduce your costs. Fast Track Room Booking also provides Real Time Access for Service Providers. No longer will you be limited to a daily catering, visitor or A/V instruction print out. Whether service providers are on your staff or external contractors, they will have live access to full requirements details, and will be notified to check their views when there are last-minute changes. Utilising Email and Text notifications, Fast Track Room Booking keeps applicable staff members and service providers up to date on all aspects which concern them. 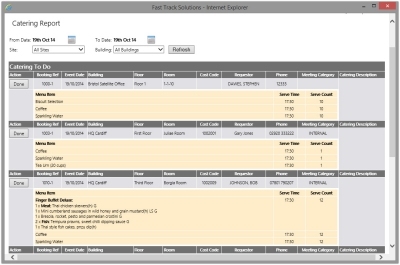 Fast Track Alerts reminds staff when bookings are approaching, and also reminds them to cancel in a timely way if the booking is no longer needed.